Statistics from Zhanjiang Customs showed that Zhanjiang exported 137,000 tons of aquatic and marine products worth 5.45 billion yuan ($808.3 million) in 2018. Exports to Africa, Mexico and the Association of Southeast Asian Nations (ASEAN) saw impressive growth last year, recording year-on-year increases of 54.1 percent, 14.3 percent and 54.1 percent in trade value. Private enterprises, which exported 95,000 tons of aquatic and marine products, remained the major contributor. Tilapia, shrimps and prawns were three most popular goods in the foreign market. Behind the scenes, Zhanjiang Customs has played a crucial role in driving exports. 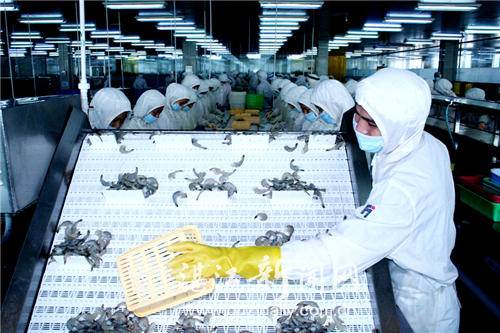 Its advice on revising the export rebate rate of shrimp and prawn was adopted by the Customs Tariff Commission of the State Council last year, which is expected to save more than 30 million yuan for local aquatic enterprises.